Summer is almost upon us. The colors of the spring are essentially made more toasty from the summer and its sun-baking. 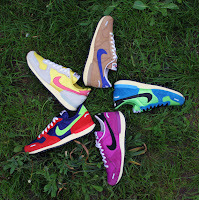 Seems like folks at Nike wanted to pay homage to the vibrancy of the season with the new release of an old fave. Originally introduced in 1985, the Nike Air Vortex features a nylon and suede upper on a running style shoe that is lightweight and great for summer stomping. Add on the 'skittled' assortment of fresh and definitely fun color and these offerings become almost a sure shot no brainer for a cool summer kicks addition. Available now at Nike.com.